℗© 1991 PolyGram Records, Inc.
Chiali speaks the intro to A4 and Angelique Bellamy does additional vocals on A5. Had this on cd back in the day. Great mid-year hip hop. Back when the lyrics were playful and not dumbed down and the sampling was still very experimental and varied. Some fantastic tracks on this record. I also agree. This is a top 5 all time hip hop album. They might not have done a lot, but this album is just fantastic. Smart, funny, serious, tough, slick; it has it all. Easily one of my top 5 hip hop albums of all time. There really isn't one beat, rap, or concept that I find weak on this LP. Dres is one of the smoothest MC's since Slick Rick. Very sly, intelligent, and witty. His cadence and flow still stand up today as top notch; definitely some of my favorite and most memorable raps. Lawnge's beats are extremely underrated... he chops and layers almost as well as Premiere, and his tracks generally have more scene changes and movements than any vocal hip hop I've heard before or since. Very original sample usage. 'Similak Child' is a good example... most producers would have ran the Jefferson Airplane guitar loop throughout the track as the base. Lawnge instead combines it with a few other pieces and actually drops it out all-together for the majority of the verses; using it instead as a layer, scene change, and breakdown. 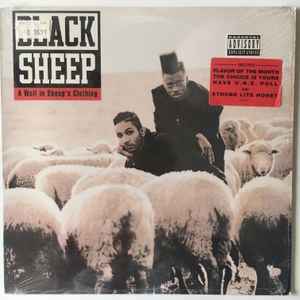 Essentially, Black Sheep combined about 3 different loops that could have been 3 different songs into one song... making for a much more full and layered listening experience... it actually goes places instead of being a static loop to rhyme over (as is the case with the majority of sample-based hip hop). Last, but not least, Black Sheep also win tons of points for their sense of humor. 'U Mean I'm Not' absolutely killed me when I first heard it back in the day. I knew of Black Sheep because of their single 'The Choice Is Yours'... so, I bought the cassette looking for more of the same.... when that track opened up, I had no idea what was going on. Hahaha... one of the funniest hip hop moments on record. Their sarcasm and sly humor is present throughout, providing a well-balanced mix with some more serious subject matter, story-driven tracks, and some of the slickest raps out there. All-around incredible Hip Hop record... highly recommended for anyone who doesn't already own it.